Vinyl cutters are used to help create custom decals for vehicles and windows, stickers, heat-press designs for shirts and hats, and more! Vinyl cutters often look like small printers and the blade is controlled by a computer. Vinyl cutters follow the designs inputted into the computer to cut out intricate designs and graphics of nearly any type. There are very few restrictions with vinyl cutters, as the blade can cut in a multitude of different ways as it travels across both an X and Y axis. Vinyl cutters can be used to cut both large banners or small stickers. The only restriction on vinyl cutters is that they can only cut from one solid coloured roll of vinyl at a time. A design with multiple colours would need each colour to be cut separately and then layered together. Biz Supplies has been selling high-quality and affordable vinyl cutters since 2011 and is proud partners of one of the oldest and most reputable vinyl cutter companies on the market – Creation Kingcut. Not only that, we are also partners of a new company – Vicsign to give you cutting-edge technology. The best part of Biz Supplies’ Vinyl cutter is the support. We provide a lot technical support to make sure you can use the cutter smoothly, correctly and efficiently. So don’t wait, contact Biz Supplies today to inquire about our range of vinyl cutters and discuss which option will be the best for your business. Biz Supplies has over 7 years experience of selling vinyl cutters. We understand that technical support is the most important part of a vinyl cutter - not only for first-time users but also experienced experts. There are many tricks of how to setup and use a vinyl cutter. We can guarantee that you will have at least 30 minutes phone or remote support for setup your cutter. We know this makes a huge different - saving you hours of reading manual, finding solution from Google, cost of hiring IT professional, etc. Not only that, we will continually support you including advise of best blades to use, designing software questions, etc. We also partner with the first company who makes vinyl cutters in China - Creation PCut. Models from entry level like CT630/CT1200 to professional edition like CB730, CS630 and CS1200. 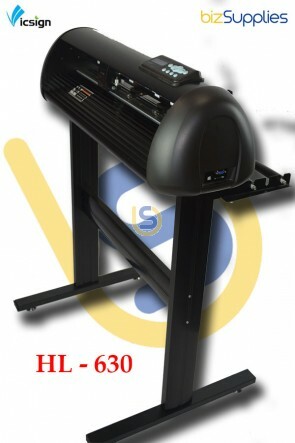 Description: Great entry level vinyl cutter for a wide vinyl roll. It can use up to 1220mm roll vinyl.